This year, Foxconn's Shenzhen factory has been hit with a rash of suicides. The company has taken measures to prevent jumpers. Now, it looks set to take the greatest preventive measure of all. It is revoking the payout it had been offering to families of the deceased. Until now, the Taiwanese based company has offered families of the deceased the equivalent of a decade's worth of pay (a little over US$16,000). This apparently was a motivating factor for some of the suicides. This will no longer be offered — which could be a good thing or a bad thing. The compensation was obliquely cited in a letter left by one of the jumpers. Foxconn previously offered workers at its Shenzen factory the chance at a 66 percent raise or $292 a month. 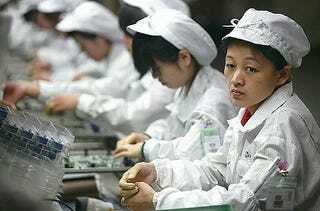 That 66 percent raise is performance based; however, all employees at the Shenzhen factory have been given raise from $130 a month to $175 a month. Thus, the financial forecast has worsened for the company, and Foxconn is now looking into relocating manufacturing to a full automated plant in either Vietnam or Taiwan. (Because robots cannot kill themselves?) Also, more orders will shifted to the existing Vietnamese plant — a plant which has not been given dramatic raises in base salary.